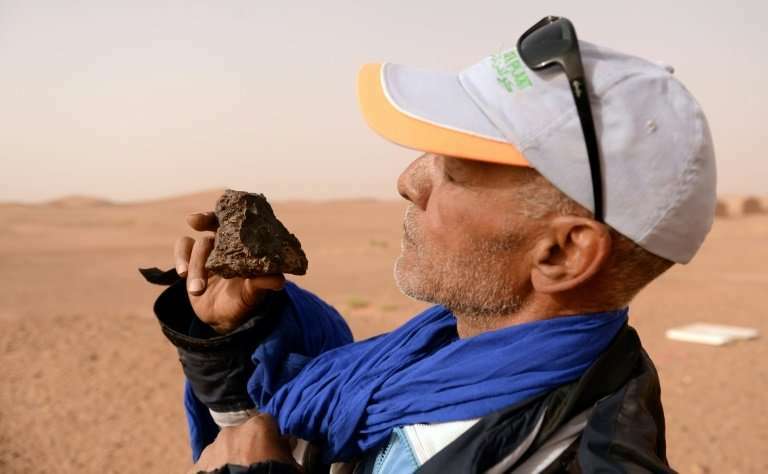 Meteorite hunter Mohamed Bouzgarine examines a rock near the town of M'hamid el-Ghizlane, in southern Morocco. 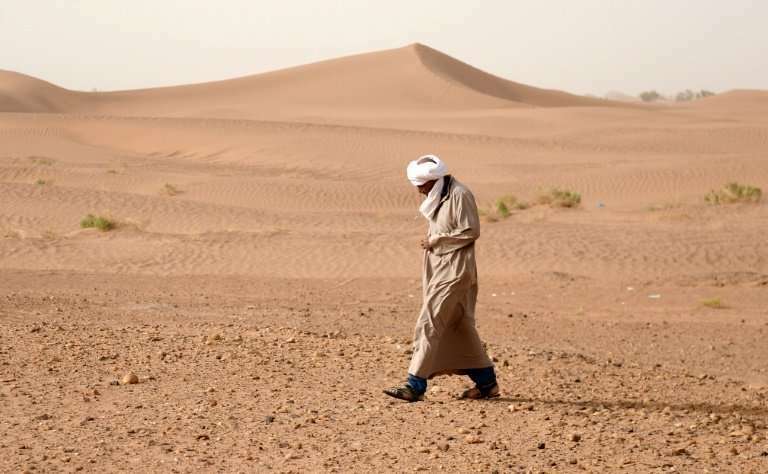 They roam Morocco's southern desert, braving the searing heat to scour the undulating sands for bounty fallen from the sky. Equipped with a "very strong" magnet and magnifying glass, retired physical education teacher Mohamed Bouzgarine says that discoveries "can be more valuable than gold". The price "depends on the rock's rarity, its shape and its condition", the 59-year old adds, sporting a dark blue tracksuit, lighter blue scarf and sunglasses. "Rocks coming from Mars are very expensive, sometimes as much as 10,000 dirhams (around $1,000, 900 euros) per gram," he says. Bouzgarine stops in front of a hollow, hoping it could be a crater formed "very long ago" by extraterrestrial matter. "It's a first sign," he says, ready to get down to work, in the township of M'Hamid el Ghizlane. For four years now, he's been sifting rocks in the sand, inspecting them for telltale signs of burn incurred during fiery journeys through the atmosphere. Others "have made a lot of money... one meteorite hunter found and sold 600 grams for 7,500 dirhams (660 euros, $780) per gram," Abderrahmane says, dressed in a blue safari suit. "From the 2000s, all the nomads started to look for rocks," he says. "At least half the scientific publications on the subject are made on the basis of meteorites collected in Morocco," geochemist Hasnaa Chennaoui Aoudjehane tells AFP. 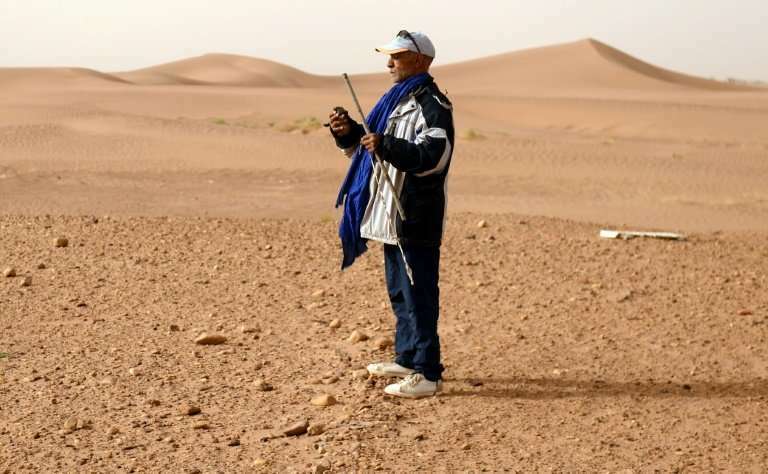 Desert zones are "favourable to the accumulation of meteorites, there is no vegetation... (and) ... the risk of alteration is low," adds Aoudjehane, who teaches at Casablanca's Hassan II university. Unlike other countries, where the state stakes a claim, there is no legal framework governing discoveries in Morocco, so it's a case of "finders keepers". In 2011, fragments of this Martian landing fell in southern Morocco's Tata region, setting in motion a scramble that saw seven kilograms of fragments recovered. Twenty days into his "holiday", paramedic Abderrahmane has been "searching for fragments" without finding anything of note, he says. A meteorite hunter searches for rocks near the town of M'hamid el-Ghizlane, in southern Morocco. Unlike other countries, where the state stakes a claim, there is no legal framework governing discoveries in Morocco, so it's a case of 'finders keepers'. "It is a question of luck—it's like playing the lottery," he smiles. "The sale is made discreetly—it is necessary to get the vendor's confidence," he says. "What one finds in the (local) souks are just odds and ends," says Abderrahmane. And there's not much money to be made at the bottom end of the meteorite sales chain. Slimane, an old man with a white beard and blue turban, sits under a tent in a souk in M'hamid, surrounded by coloured fabrics, outdated jewels and old coins. But they're "not worth much", he confesses. "I have not risen above penury through rocks," he laments, arms raised to the sky.